Ronald Abdala, a graduate of ESMOD-Beirut and Central Saint Martins in London, has emerged as an internationally recognized creative designer. Born in London in March 1979, he attended schools in London, Lagos, Paris, and Beirut. In 1996 he enrolled in a fashion design program at the Fashion Institute of Design and Marketing in Los Angeles. He joined ESMOD- Beirut in 1999 and graduated top of his class with a Bachelors Degree in Fashion Design. In 2002, he was accepted at Central Saint Martins in London to complete a two-year program, which included fashion marketing and experimental fashion with David Kappo.In 2004, he joined one of Beirut’s most successful couture houses: “Maison Rabih Kayrouz” as senior fashion designer. In the summer of 2007, he successfully launched his Label “Ronald Abdala”, and in May 2011, opened his first brand boutique in downtown Beirut. In 2010, Ronald became the first Lebanese designer to be selected for the prestigious Maison Euro- Mediterraneene De La Mode scholarship program, supported by the French Ministry of Culture. He was the first Lebanese designer among only seven international candidates selected for the prestigious Maison Euro-Méditerranéenne De La Mode scholarship program in 2012. 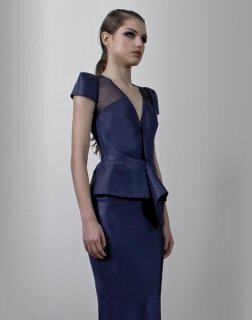 THE BRAND: Ronald Abdala is an innovative fashion design house offering seasonal collections of ladies’ high-end ready to wear, made-to-measure couture evening gowns, and bridal dresses. This luxury brand addresses the modern, dynamic, fashion-forward woman. Designs are characterized by structured cuts, creative detailing, and subtle feminine lines, crafted with rich fabrics and intricate hand-embroideries. The style: edgy, original designs that evoke both glamour and elegance.